Choosing and installing steam shower lights isn’t as hard as it looks. 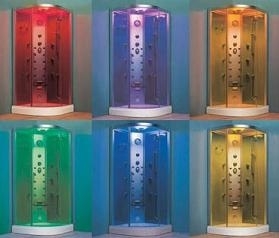 The light for steam shower should be based on color and ambiance which we shall look at in detail. We will also discuss some tips and tricks you should pay attention to.. Steam shower lights are an extremely important part of designing and installing your steam shower. Don’t make the mistake of thinking that these lights are like any other. They must be carefully chosen and installed as they will have to withstand steam, heat and water from your steam shower. Specially made steam shower lights are made to endure these harsh conditions so they can live a long life and not become damaged as a normal light bulb would. Besides the importance of the lights to see, they also have an aesthetic role. They play the role of creating an ambiance and mood which would aide in relaxation. You can also install recessed steam shower lighting which can further enhance mood. 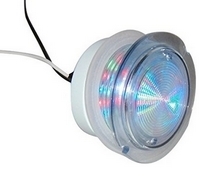 So what are the types of lights you can install? Well one of the first things you might want to consider is the color of the lights. Different colors are appropriate for different times of day and apply to the type of mood you are trying to create. Blue: This color represents peace and tranquility and can enhance a relaxed frame of mind. Green: This color is associated with nature and is very soothing. This color promotes healing and is very calming. Purple: This color represents spirituality and transformation. Red: This is a very warm and energetic color. It evokes great passion and energy. Yellow: This color represents joy and optimism. Orange: This is a combination of red and yellow and represents balance. It is warm and vibrant and evokes such emotions. White: This color contains all other colors and is thus seen as the color of perfect balance. Besides considering color, you should also pay attention to the type of lights. It is advised that you purchase LED shower lights. 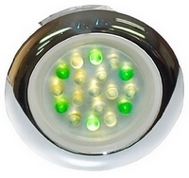 These lights are very easy to install and are readily available. They are known for reducing energy consumption and they stay a lot cooler which would allow them to last longer in your steam shower. So how do you install your lighting? If you bough a prefabricated steam shower kit, then they would have most likely already come equipped with lights. However, if you were building your own steam shower then here are some tips you should pay attention to. When you are building your own steam shower don’t forget that you will have to cut out holes in the tile or glass to fit your lights. It’s important to plan this out properly instead of just fitting them in any fashion. Before you cut out the holes for your lights, make sure that you have your plumbing and pipes already installed. The reason for this is because you do not want to place your lights near to any shower heads so that you can avoid the direct impact of steam and heat on them. Another thing you need to make note of is that the steam shower generator would need its own separate circuit. So make sure that you wire your steam shower lighting separately. Safety is an obvious concern and whenever you are working on wiring ensure that the power is turned off. Make sure that you are not handling any live wires as electrical shocks are very dangerous. You also have to take safety precautions when cutting glass and tiles. Wear appropriate face protection gear like goggles and a mask whenever you are operating the saw. A final tip, when buying shower lighting, make sure that it matches your décor and design of your bathroom. If you are having problems installing the electrical you can buy battery operated shower lights. This will save you a lot of time and energy and you can move them around easily. However, if you want something permanent you can of course call in the professionals.